Now let's check out how you can use some of the substitutions you learned earlier to add some super cool embellishment sounds to our major and minor barre chords with the root on the 6th string. 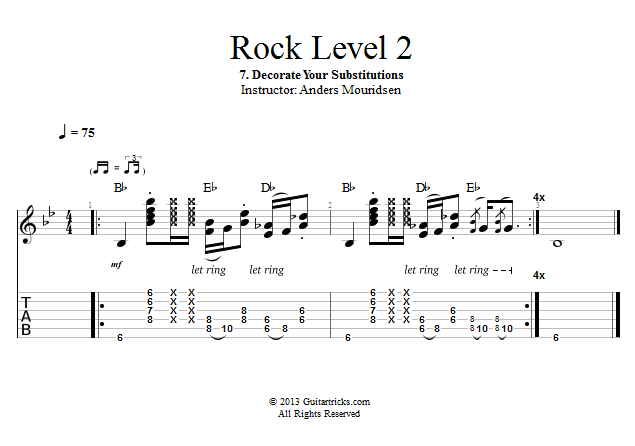 The substitutions will be derived from the first 3 scale degrees in our minor pentatonic scale: Bb, Db and Eb. Then we're going to use an alternative voicing for the Db and Eb, and I'm sure you'll recognize the sound of it.